Corporate Flight Attendant Community: For Private Jet Flight Attendants! The NBAA's static display in 2003 featured the usual selection of aircraft. In the cabin class size, the BBJ, Airbus Corporate Jet, Gulfstream 450 et al, various Bombardier offerings and the Falcon 2000 all stood out. Another player, Embraer, the Brazilian aircraft manufacturer, featured a pair of models under the Legacy name. The Legacy Shuttle is configured to carry from 16-39 passengers while the Legacy Executive typically carries 13-16 passengers. For cabin class comparison we will look at what the Executive has to offer. Matching up to aircraft in its class, the Legacy is similarly appointed. The Embraer model on display had all the creature comforts usually found in aircraft of its size and the cabin was well appointed and configured to fly 13 passengers. The display model featured fine quality hardwoods, fabrics and finishes, in addition to a sideboard, tables and three-seat sofa. The passengers have access to Airshow systems, DVD, real time communications, telephone and fax in the cabin. The cabin can be furnished with working tables for staff meetings and individual workstations at the required seats. The aircraft featured a full galley and resembled those found on many Gulfstreams and Falcons. Embraer claims to have largest cabin volume of any super mid-size jet as well as the largest baggage compartment. In addition, the aircraft features three cabin zones which they claim is unique in this particular aircraft category. Anyone approaching six feet in height would have to constantly bend their head to navigate the cabin. Like the Challenger 800, headroom is at a premium for taller individuals. While I was onboard the Legacy, one other visitor vocally complained about the interior dimensions and he was slightly shorter than my 5' 11" frame. With a range of 3,250 n.m. the Legacy is not the Global Express, but it does compare favorably dimension wise with other aircraft in the super mid-sized category. 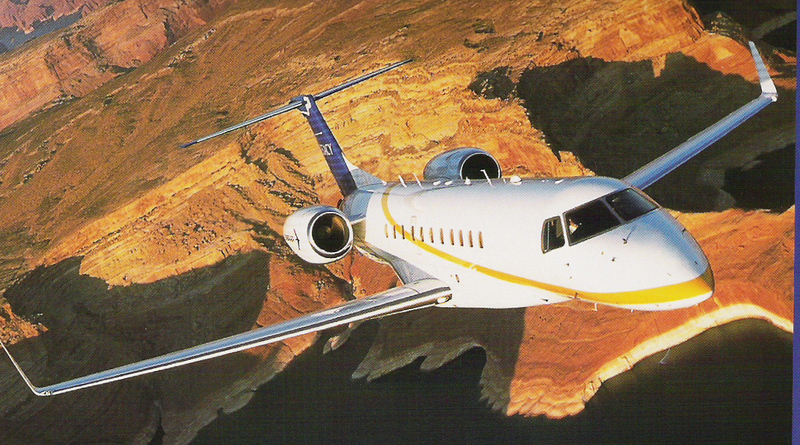 The Embraer received type certification from the FAA in September 2002. The aircraft is derived from the ERJ-135 and ERJ-145 commercial regional jetliners. The company is marketing the Legacy at prices significantly lower then the competition. Indigo was noted for their "city pair" flying between Midway and Teterboro.